Editor’s Note: The Simple Dollar’s Trent Hamm used to have debt. Lots of it. And, like many of us, he used little windfalls like annual tax refunds for debt management. But it wasn’t until he used his tax refund as the first step in a brand new spending lifestyle that he was finally able to climb out of debt entirely. Today, he’s living debt free and his personal finance blog, The Simple Dollar, helps people find simple ways to manage their money and build the foundation for a financially secure future. Several years ago, I was buried in debt. Five figures in credit card debt, two car loans, furniture loans, home electronic loans – I could barely keep up with the bills and I didn’t even have a mortgage. I always viewed tax time as something of a blessing at that point. I generally received a refund of around $1,000 each year, which usually went straight toward paying down debt. I’d file my income taxes at the first possible moment, and then I would practically camp out by the mailbox waiting for that check from Uncle Sam to come in. Yet, by the end of summer, I seemed to always be right back where I started. The tax refund check was gone and the debt level was rising again. I was right back to the point of writing checks from one credit card to pay another and letting some bills slide until the next paycheck came in, only to find the cycle repeating itself when the New Year rolled around – taxes filed, check received, breathing room earned, and then slow sinking into the quicksand of debt again. Eventually, I managed to take control of my finances and today I’m debt free, owning my own home free and clear. What caused that change to happen? I made one simple realization: no matter how many times I put off the debts with my tax refund check or other little windfalls, the debt would still come back to haunt me. The tax refund check was a relief, but by itself that check didn’t change my situation. 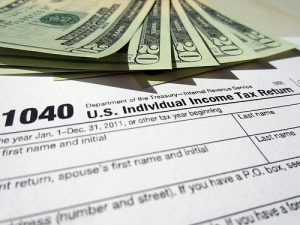 If you’re in a situation like I was, where the tax refund check is coming just in time to keep your head above water for a little while longer, don’t look at that check as a relief that enables you to keep spending the way you’ve been spending. The debt will just keep coming back. Instead, look at that refund check as the first big step in a new way of managing debt and your finances. First of all, do you have an emergency fund? At a bare minimum, you should have $1,000 in cash sitting in a savings account in case of a genuine emergency, like an automobile repair or a sudden job loss. Make sure you have that before anything else and refill it if you ever find yourself using it for a real emergency. Next, make a debt repayment plan. Take all of the debts you have and figure out the balance and the current interest rate on each of them, then order them by interest rate with the biggest interest rate coming first on the list. Your goal should be to make threefold: don’t increase any of these debts any further, make the minimum payment on each debt on the list each month, and make a double payment on the first debt on the list each month (you can skip the double payment if you need to refill your emergency fund that month). After that, keep track of every dime you spend for a month. Keep every little receipt and, if you don’t have a receipt for something you spend, write it down on a slip of paper and keep it with the receipts. At the end of the month, sit down and look at every dime you’ve spent. Go through the credit card bill and the bank statement as well so you can see where your money is really going. Mark all of the unnecessary expenditures and make a list of just those things that you didn’t really need to buy. Strive to cut out just 25% of those – or, if you’re feeling brave, go for cutting out a bigger slice. If you spent $1,000 on unnecessary stuff during that month, shoot for $750 the next month. Then just cut out the stuff that’s relatively unimportant to you. Just keep an eye on your unnecessary spending for the month and strive to keep it under that target. This alone will make sure you have the money to make that double payment each month. Use that tax refund check to get this plan started right. Make an emergency fund out of it or use it for a big payment on your worst debt. Trust me, it will feel really good to start heading in the right financial direction, and this tax season can be the start of that change. Trent Hamm is a personal finance blogger and founder of The Simple Dollar, a blog which explores personal finance from the perspective of a late-twenty something. Trent is the founder of The Simple Dollar, a blog for those of us who need both cents and sense: people fighting debt and bad spending habits while building a financially secure future and still affording a latte or two.